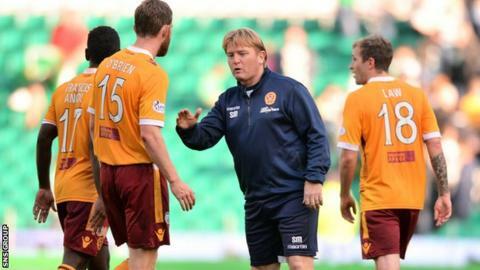 Motherwell are braced for a flood of applicants following the resignation of manager Stuart McCall, according to general manager Alan Burrows. "An hour after Stuart had left, we already had 10 people put their names in," Burrows told BBC Scotland. "I don't think there will be any shortage of candidates. "Stuart enhanced his career here, as did Mark McGhee and Terry Butcher. It's a club that can really do a lot for good managers." The Fir Park board reluctantly accepted McCall's decision to step down after a sequence of five defeats. The 50-year-old former Scotland international joined Motherwell in 2010 and secured two runners-up spots in the top flight. However, this season has yielded just two wins from 12 Premiership matches and the Steelmen sit second bottom of the table. Assistant manager Kenny Black will take charge of the first team in a caretaker role as the board seek a replacement McCall, who is part of Scotland manager Gordon Strachan's coaching staff. "[Stuart McCall] is someone I don't think will be out of work for long. His record here is fantastic"
"The board has a history of leftfield appointments, people you might not expect, so that's something to bear in mind," added Burrows. "I spoke to Stuart at length on Sunday and he was typically very honest. He was calm and measured and he thought it was time for him to move on. "He felt a freshness would help both him and the club." Motherwell skipper Keith Lasley said McCall would be remembered as one of the club's greatest managers. "The period of consistency we have shown in the league is unprecedented," said the midfielder. "He is someone I don't think will be out of work for long. His record here is fantastic. "They are big shoes to fill but someone has the chance to come in now and turn things round, which we are all desperate to do." Former Motherwell defender Craig Paterson admits he is surprised by the Lanarkshire club's current predicament. "When you look at the squad, I thought there was enough quality there and Stuart's a quality manager," he told BBC Scotland. "I thought they would come through this. "They are in the relegation area with seven points. Last season they had 22 points at this stage, so they are way behind." Several former players have already been linked with the Fir Park vacancy but Paterson thinks some of the suggestions are fanciful. "Derek Adams I'm sure will come into people's thoughts, you'll get Owen Coyle and Billy Davies mentioned but these guys will still be thinking there's a big job in England for them," he continued. "Will they go for experience or a young man with enthusiasm? "It's important they get someone in and they need to start picking up points because they are far too near the bottom for the quality of players they have at the club."